Last week, we showed you the back of the unannounced HTC M8 Ace, which seemingly has a single-lens rear camera, and a plastic construction instead of a metal design (like the One M8 has). The handset appeared in other two photos today, thanks to the fact that it was recently approved by Chinese authorities. As you can see, now we're able to take a look not just at the back, but also at the front of the M8 Ace. Unsurprisingly, this isn’t too different (shape-wise) from the front of the One M8. It’s true that the new smartphone looks a bit odd - but don’t worry, we’ve noticed that photos released by Chinese authorities make almost any device look worse than in real life. 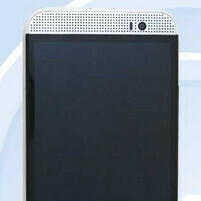 According to @evleaks, the M8 Ace sports a 4.7-inch display, not a 5-inch one, as previously rumored. Its resolution isn’t known, but we assume it's 1080p. It doesn’t look like the One branding is part of this handset’s name. However, it’s too early now to be certain of that. HTC will most likely announce the M8 Ace before revealing the M8 Prime. Unfortunately, exact details about this aren’t available, though Taiwanese website ePrice suggests that the M8 Ace might be announced on June 3. We’ll be here to let you know if that happens. The speaker grill looks kind of awkward. So many holes! then they said htc is the king of design ! Large no thanks. Looks like speaker grilles from old HTC that had a slide out speaker on side. Think it was an early wp7 device..forgot about it until seeing this. Seems like garbage to me. I was thinking a soft touch polycarbonate version of the M8 would be amazing, this is not amazing. This is just another example of how HTC is their own worst enemy. They'll make something almost perfect with one major drawback. This one's drawback is fugly. Yikes when I first saw the picture I thought they were referring to the m8 Prime, but I forgot they were also making the Ace. Not really a fan of such large speaker grilles covering the entire surface somehow makes it seem cheap. I used to be a HTC Fan boy, but even now im admitting that htc lost it. Weird. I didin't like it. And as always with a lot of large bezels.